Hello! If you’ve never found your way to 2ser’s new music review, it’s where we compile the best new music from around the world for your enjoyment. So click play on the Spotify playlist, take a read and discover some new favourite albums! Tal National may not be a name that you’re familiar with, but in their home country of Niger, they are a household name. On their new album Tantabara, rock meets blues meets afrobeat in some of the most energetic music you’ll hear any time soon. The time changes here are thrilling. One second you’ll be enjoying some slow blues guitar, the next you’ll be dancing uncontrollably as the drums reach an unbelievable pace. 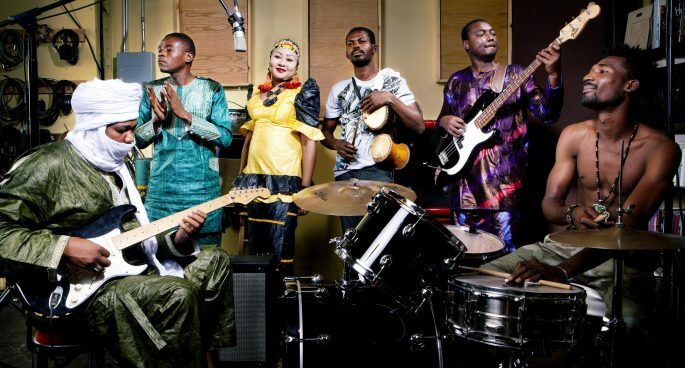 The band has been on a quest since their formation in 2000 to let people know that Niger is not the same country as Nigeria. And an incredible album like this should help put the Western African nation on the map. The debut LP from Sydney beat-maker Godriguez. Vol. 1 ‘14 – ‘18 was compiled from 7 beat-tapes of over 6 hours worth of beats, created over 4 years. If some tracks sound familiar, it’s because they are backing beats to one of Australia’s best hip-hop of artists, Sampa The Great’s past work. Godriguez takes influence from countless styles, ranging from classical to Cuban religious music to flamenco. But his production ability makes everything flow, and allows him to create his own unique sound. Lastly, we’re LOVING album number six from Californian folk artist Alela Diane. Cusp explores themes of motherhood and childbirth, which oddly still seem to be artistic taboos. But Alela Diane doesn’t hold back here. The title ‘Cusp’ is inspired by her near loss of life during childbirth, and her realisation that we are always on the cusp between life and death. The delicate guitar of her previous albums has largely been replaced by piano here, which contributes to the gentle nature of this album, and suits the intimate subject matter of motherhood. Also this week, new singles from the likes of Courtney Barnett, Space Invadas, Okkervil River, Sydney newcomer Dominic Breen, Intaloopa, Stonefield, La Luz and Another Sky.